If you’re a writer, chances are that you have an inner muse. Some writers wax poetic about how their muse brings them glittering plots that they pull out of the air like magical, sparkling fairy lights that appear out of nowhere. Inspiration finds them everywhere, because that diligent little muse of theirs has spent some time (obviously) floating around the universe hand picking the best and most important characters and plots, poems and lyrics just for them—like an Etsy store for your writerly soul. Of course, mostly the whole idea of the muse got really old around the time that ancient Greece did too. So why am I talking about invisible writing friends? Either I need to get out more, or there’s some truth to this madness. My muse and I are a little more like frenemies. She (he?) does eventually show up to work, but sometimes she would rather do something else. I can imagine her out there, coasting around and daydreaming about whatever invisible people daydream about. I can’t blame her, exactly. Sometimes the going is tough. Sometimes, it’s hard to sit down at the desk and feel blank. This is usually when the muse has decided to not show up or instead sits on my shoulders and pulls my hair into odd little curlicues –it is so not helpful. In her TED talk, Elizabeth Gilbert talks about the “elusive creative genius” of ancient Rome and Greece as being a divine spirit or “Daemon” that was a magical entity that lived with the artist and helped them to create things. 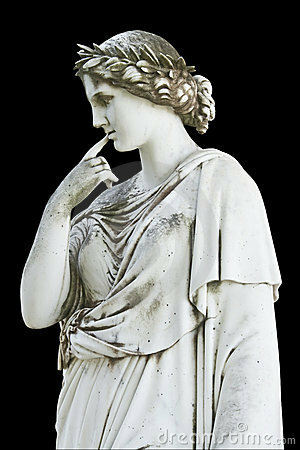 Muses have been around for a long time. Of course, back in the day, it was completely normal to say something like “yes, I realize that book I wrote was kind of lame, but it was my muse’s fault. She had an off day.” What is particularly interesting about this lecture on muses is the idea that at some point, we stopped thinking of our writing in relation to muses and instead took on all of the blame, praise and stress ourselves. Writing became a solo task. What I think is kind of sad about this lack of belief in the muse is that the pressure is high—if something doesn’t turn out the way it was supposed to, there’s no one to chastise but myself and that isn’t very conducive to the writing process. Elizabeth Gilbert’s point about believing in muses for our sanity is a good one: blaming the muse does kind of alleviate the stress of having to come up with something that is pure genius all the time. It’s like blaming the dog when you’ve eaten one too many enchiladas. We all do it, so why deny it? Blame it on the Muse.